We are celebrating the best day of the week with Michelle from The Whole EnCHELLEada. If you haven't been hiding under a rock, then you know that Ms. Michelle is about to become Mrs. L in a few short months! Thank goodness that we all didn't have Pinterest when we planned so let's enjoy the process with the future Mrs. L! Pinterest has revolutionized wedding planning. Yep, that's a bold statement but it's true. Over the past few months I've been pinning away, collecting ideas for all of our wedding details. With a little over four months to go, it really is time to stop pinning and start doing. I used this month's Pinterest-a-thon as an opportunity to get started. I want the decor at our wedding to be a true reflection of the things we love. 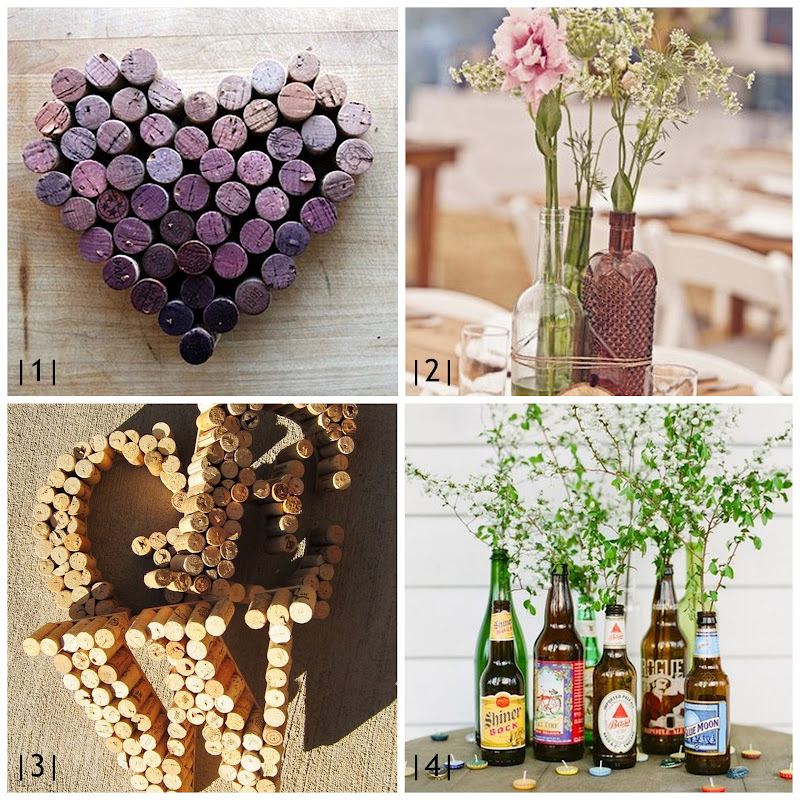 Two things we love are beer and wine, which not surprisingly will both be served on the big day! The pins above caught my eye as a way to incorporate those items into our decor. I envision these items placed on the bar or on one of the two mantels we get to decorate (eeps, can you feel my excitement!!!). For the last year or so we've collected wine corks to use someday, and today is that lucky day! I followed this tutorial from Tip Junkie. The instructions are pretty basic, as is the entire project. I decided to go with an ombre look (so hot right now!) with the corks. 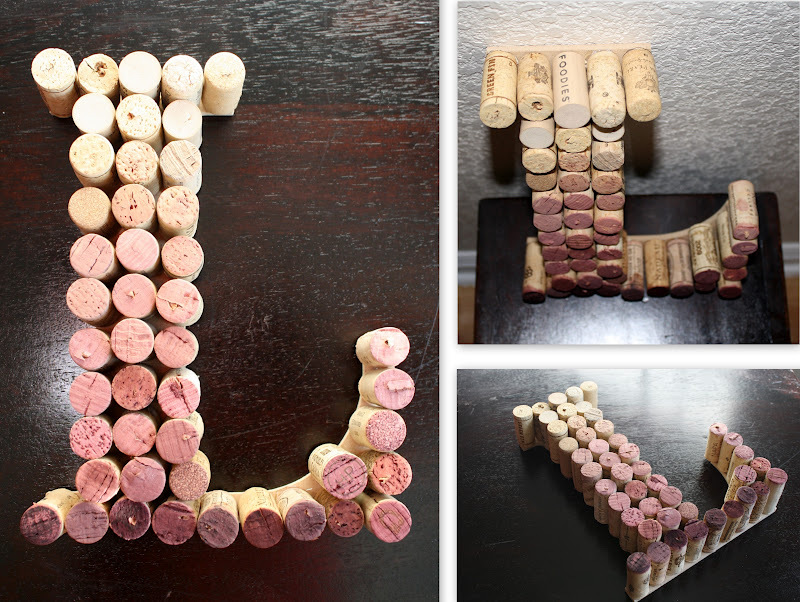 I also worked hard to make sure the Charles Shaw corks were mainly in the center. We're not ashamed of Chuck, just didn't want him to dominate our L. Speaking of that L, the craziest part of this project was making an "L" and realizing that I am getting married and changing my last name. Sometimes I forget that part because I'm too busy mentally decorating the mantels. Using the remainder of the corks I made a heart. I set all the corks out first to decide how to make it, using the pin as my guide. My suggestion is start at the bottom point and work your way up! I absolutely love the outcome of this and it only took about 20 minutes to make. 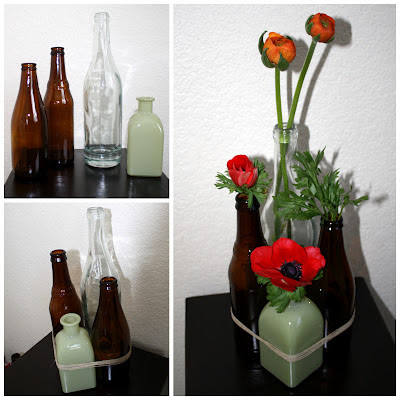 Last but not least, I put together an arrangement of recycled bottles to create a flower vase. The brown beer bottles came from our "collection" of bottles to be resused for B's homebrew. The clear wine bottle-esc Glass Vase and Bud Vase are both from West Elm and made from recycled materials. I used a little bit of twine to wrap them all together in one unit. To complete the look I popped a few single stems flowers (anemones and ranunculus) into each bottle. After the wedding I hope to place this L and heart on a well styled bookshelf or in the bar of our future home. The bottle will make it back into rotation for the homebrew and the vases for flowers or other projects! Until next time....pin, pin, pin (reference here: Sh** Brides Say). Visit Michelle on Pinterest and plan your wedding in less than 24 hours with the great ideas collected here! Don't forget to link up your Pinterest inspiration this week during our Pinterest-a-thon linky party. Click here to join in the fun! 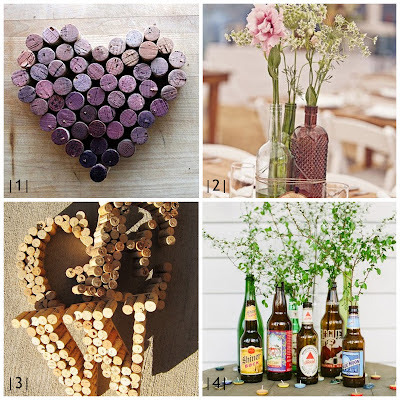 I love the wine-stained corks. I'm already married, but I plan to use this (just pinned it) for a grown-up birthday party.